Sing Your Story in the Classroom brings collaborative songwriting games to your students in a fun confidence building experience while teaching basic musical elements and summarizing abstract concepts into simple to understand lyrical statements. In just one 45 minute songwriting workshop I can add to your existing curriculum, provide a creative break for students, or start you on the process of producing a musical fundraiser for your scholastic program. It’s not only fun but it builds a great sense of team and community while instilling confidence. I would love to hear your ideas! Send me an email at info@fernandotarango.com. How much will it cost our school? Most sessions can be arranged in person for $150 USD per classroom plus travel time or via Skype. No school will be turned away for lack of funds. Below are some “Acoustic Sketches” of song ideas I have had the pleasure of creating with students and young audiences who have shaped the creative process by choosing the harmony, rhythm, lyrical content and more. 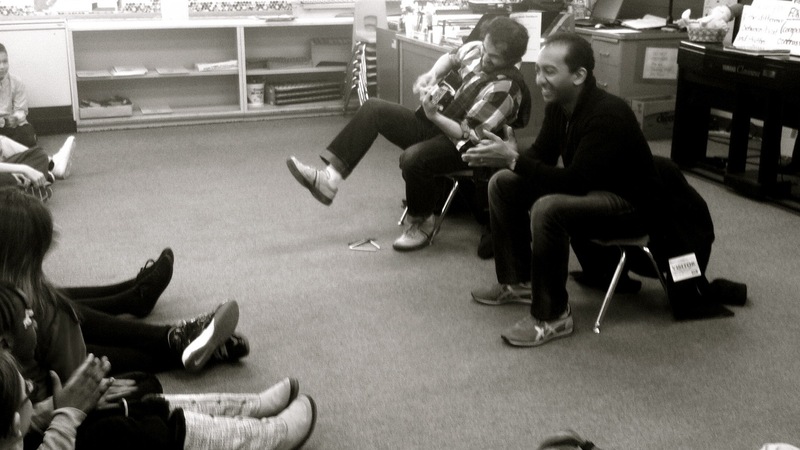 Here’s a snippet from an improvised classroom song that stemmed from the students’ conversation about music with Associate Conductor of the San Diego, Symphony, Sameer Patel.